There are three cities in the world that I miss quite often. That I think about quite often and wish that I'd be visiting soon. Nothing to do with bicycles, just the cities. Paris is one of them. Which are the two other cities that you miss? Paris me manque terriblement aussi. Haven't spent serious time in Paris since 2003, when I was there twice; in the summer for two weeks and for the European Social Forum in November - though the weather was unseasonably nice. I was in Paris again in 2006, but just between a plane and the train to Amsterdam - I met some Parisian friends at a café near Gare du Nord, but didn't have much more than a few hours there. Non, not obsessionally because of bicycles, because Paris is also about the best big city for walkers (I suppose one could make a case for London as well, but Paris is much more compact). But the development of modern bicycle culture, and more and better modern public transport (trams, dedicated bus lanes) have made Paris more poetic still, and reversed the nasty "tout-auto" encroachments on the lovely city that culminated under Pompidou. I happened to be in Paris when the 1995 public service strikes broke out and saw the very birth - or rebirth - of everyday bicycle culture, with commuters hauling out their bicyclettes to get to work and back. You and Mark of Amsterdamize might be interested in the song by Georges Moustaki and Vincent Delerme, "Une fille à bicyclette" - it is an authentic cycle chic image, as la fille crosses île St-Louis. The song concludes "Merci, monsieur Bertrand", an allusion to mayor Bertrand Delanoë, who has supported better bicycle and public transport access in Paris. There are various sound files and youtubes available on line,but I haven't found the lyrics printed yet. Sootjeelina, there has long been a friendly rivalry between Mikael of copenhagencyclechic and copenhagenize and Marc of amsterdamize, and a lot about Netherlands here, and about Denmark there. Marie of CCC has also visited Marc in Amsterdam. 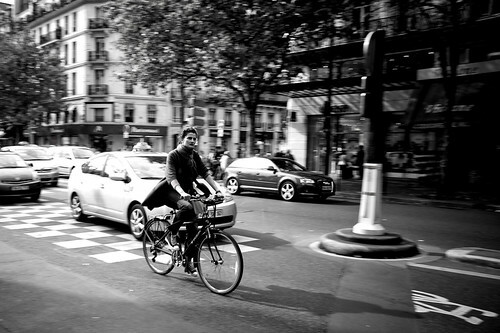 What is nice about Paris (among many other things) is the emergence or rather re-emergence of daily cycling culture. And it can be really a tipping point for the development of cycle chic in the Western world at least. Now if only the Dutch and the French could gang up on the country in between and convince Brussels to become a cyclable city. Cette ville fait pitié! Sure it has some hills, but so does Paris. the other one is san francisco. sunny and 70 today. bring your bike. we love europeans. Beautiful photo. I will be visiting Paris for the first time in October and I'm counting the days. I'll be all over the Velib. now i've returned to australia, i truly feel i have been to 'heaven & back'!!! For me, the other cities are Tokyo and Berlin. You know, I really wish I could visit Copenhagen again soon. Can't believe it's almost been a year since I was there. Hell, I'm daydreaming about taking a cycling holiday all through Sjaelland right now. Sue, I'm so glad you got to Paris. Hope you were able to also take in either Copenhagen or Amsterdam (the latter is easier to get to from Paris, on the Thalys train) to take in a "mature" cycling culture. My name is Miguel from México. Pleaseeeee: Which are the other two cities? Tokyo and...? Its my bet. I sleep with a map of Paris next to my head each night. Meli, I would love to show you around one day. A badassé rendez-vous sounds like a fantastic idea! you're right about Tokyo, Miguel. Berlin is the other one. I knew it! Tokyo is, using your words, one of the cities that "i miss quite often" too! I love that city. And New York too! Saludos de Miguel desde México. PD. Oh, and i've been in Copenhagen too. And i LOVED all those beautiful girls in bikes. Their look so good with those shoes in the pedals... Beautiful! Bye! Miguel. "Paris is one of them." Prague is one of mine, but I fear the Prague I'm missing doesn't exist (the Prague Spring one; but absent the Soviets). Timing may have been everything on getting back there and I missed it. Cities that intrude into my thoughts because I have seen them only in transit leaving tantalizing images I'd like to explore further (by bicycle of course) include Sevilla, Vienna and Amsterdam. And of course this blog makes me think about the possibilities of visiting Copenhagen someday.